Honey is very good food. It is known for many health benefits. Honey also work as medicine for the body. Anti-oxidant: Honey is full of anti-oxidant, vitamin and protein. The daily consumption of honey removes toxins from the body. Skin: Honey has anti-bacterial property that makes skin shiny. One can use honey on face. It gives coolness to the skin. Sweet: One can use honey instead of sugar. It controls blood sugar and weight. Honey contains vitamin B6, folic acid, vitamin C, iron, calcium, sodium, zinc, potassium, phosphorus and minerals. It keeps metabolism healthy. Honey also avoids cardiovascular disease. Cholesterol: Honey does not have cholesterol. Honey contains vitamins and minerals that reduces bad cholesterol. The daily consumption of honey has positive impact on anti-oxidant. It is beneficial to fight against cholesterol. Heart: The research has shown that anti-oxidants of honey avoids blockage of arteries and many heart disease. 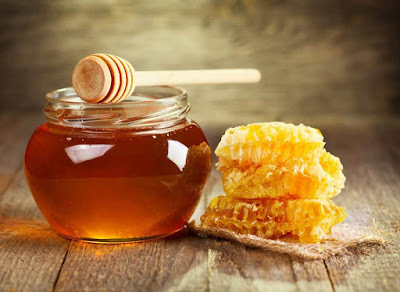 The use of honey increase the anti-oxidant amount in blood. Stress: Honey is beneficial in stress. Honey increase the memory power if women eat it in menopause. Honey helps to absorb the calcium. It is also beneficial for mind. Stomach: Honey contains anti-bacterial property. Therefore, one teaspoon honey in morning gives benefit. It avoids many stomach problem. Bacteria are not formed when honey in the stomach, and small wounds in the mucosa are also filled. Insomnia: The mixture of lukewarm milk and honey gives good sleep. Other Benefits: Garlic has many benefits. One can use garlic with honey. Honey and garlic strengthens the immune system. It is beneficial in cold-cough and fever. Prepare mixture of honey with garlic and eat it daily morning. It gives benefit to the body.